Other tutorials in this series cover creating new patches, but here's a tutorial about how to manage the patches you already have. This tutorial uses the patch bank browser in version 2.2.1, so if you haven't downloaded it yet, get it at the Crystal web site . If you've got the latest version, you should see a section labelled "Browser" on Crystal's Modulation page. First, a couple of terminology items: I use the term "patch" to mean a snapshot of of synth settings. This comes from the old days when synths were programmed using patch cables to connect one module to another. Another term that means the same thing is "program". I use the term "preset" to mean a patch which has been loaded into Crystal. Crystal has room for 128 presets and all 128 form a "bank". This bank of presets is saved with your song, so when reopen your song, any edits you made to those presets are restored. That's great because you'll always get your project faithfully restored when you open it later. However, sometimes you may want to reuse patches that you created in one song in another song. It is generally difficult to retrieve a preset from one song and use it in another. That's where .fxp and .fxb files come in. If your plugin host support import and export of .fxb and .fxp files, you can save a preset patch to a .fxp file or the entire bank of presets to a .fxb file. You can then go to another song and load one patch into Crystal by importing a .fxp file, or you can load an entire bank of patches by importing the .fxb file. When importing a .fxp file, the current preset (as selected from the preset menu) is overwritten with the imported patch. When importing a .fxb, the entire bank of presets is overwritten with the patches from the .fxb file. If your host does not support import and export of .fxb and .fxp flies, that's no problem because .fxb files of Crystal patches are readily available and Crystal itself contains a patch browser which can read .fxb files and can write individual presets to an existing .fxb file. Before we go further, familiarize yourself with a few Crystal controls. The first is the "Utility" menu. This is the menu just to the right of the "Poly" button. This menu has the VoiceCopy and VoicePaste items we used in the last tutorial. Below the Utility menu is the "Presets" menu. It's the downward pointing arrow. When you popup that menu, it shows you all 128 presets currently loaded into Crystal. To the left of the Presets menu are a pair of arrows, one pointing left and one pointing right. These step through the presets. On Crystal's Modulation page you'll find the "Browse" section. This section contains the "Banks" menu and the "Patches" menu. Ok, now that we've got the preliminaries out of the way, let's get going. There is also a Crystal21 presets bank on that page, but don't download that. Now, find the Patch bank browser: click on the "Browse" tab in the "Patches" section on the Modulation page. Next, just drag the bank (.fxb) files, one at a time, to the "Import Bank Drop" well in Crystal's Browse tab (under Patches on the Modulation page). Crystal comes preloaded with 128 preset patches, so you'll always find those on the preset menu when you start Crystal. I'm kind of fond of many of those presets, but there are only 128 to choose from. Having lots of things to choose from is usually good in life, so we want more patches to choose from. That's where the Patch Bank Browser comes in. Go to the Banks menu in the Browser. On that menu, you'll see the names of the 4 patch banks you imported. Choose "Vintage1.fxb". If you click on the "Patches" menu, you'll now see a list of names, starting with "HackSaw". These are the names of the patches in that .fxb patch bank file. Choosing a patch from this menu will load that patch into the current preset. Go ahead and choose "HackSaw". Play a note and you'll hear an analog-style patch. Also note that the name "HackSaw" now appears in the Parameter Display below the Poly button. That serves as confirmation that the patch was imported from the .fxb file into the current preset. See those two arrows, pointing left and right below the Patches menu? Those step through the patches in the selected patch bank file. Go ahead and click on the right arrow a few times, playing a note each time to listen to the result. Note how each time you click on the right arrow, the parameter display is updated to show the name of a new patch. If you click on the patches menu again, you'll the names of the patches you've been importing. So what is happening when we import a patch? The current preset is overwritten with the imported patch. That means if you're looking for several patches to use in your song, you can browse until you find one you like. Then, change the current patch by using the presets menu and start browsing again, importing into the next preset slot. Using that technique you can import up to 128 patches into Crystal's presets. If you've browsed through the entire "Vintage1.fxb" patch bank file, go to the Banks menu and choose another bank file and start browsing through that. By doing this you have hundreds of patches at the tips of your fingers, accessible with just one or two mouse clicks! If you want to rename or remove a patch bank, choose "Show Crystal Folder" from Crystal's Utility menu. The .fxb bank files are in the CrystalPatchBanks folder. You can rename or delete the .fxb files you find in that folder. To refresh Crystal's Banks menu after making those changes, select "Banks" from the Banks menu. When you import a patch, it overwrites the current preset. What if you did that by accident and want the overwritten preset? No problem, just choose "Revert" from the Utility menu. Also, since importing a patch overwrites the current preset, that means the original Crystal presets will be overwritten as you import patches. What if you later want to use one of those original presets? No problem. That's why we downloaded the FactoryPresets.fxb bank. If you browse that bank, you'll find all the original preset patches. Of course, many times when you import a patch, you'll end up tweaking it before you're happy with it. Because it is imported into a preset, your tweaks will be saved with your song. But, what if you want to use that tweaked version in another song? No problem. Notice how the Vintage1, Ambient1, and Motifs1 banks have unused patches? Those are for you to add your own patches. Say you imported "HackSaw", but tweaked it to make it just right for your song and now you want to make it easy to use that tweaked version in another song. First rename it by clicking on the parameter display and typing in a name, for example "MyHackSaw". If it isn't already selected, choose "Vintage1.fxb" from the Banks menu. This means we're going to write the MyHackSaw patch to the Vintage1.fxb bank file. Now choose "unused" from the "Save to..." menu (below the Patches menu). This writes MyHackSaw into the slot previously occupied by the unused patch. 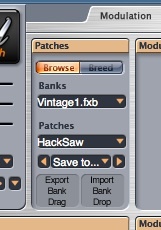 Popup up the Patches menu and you'll now see MyHackSaw in the menu of patches for Vintage1.fxb. If you later, in a different song want to use MyHackSaw, simply browse to Vintage1.fxb using the browser and you'll have MyHackSaw right there waiting for you in the Patches menu. What if you want to create a new bank of patches from scratch, without overwriting any existing patches? Just download and import the Unused.fxb bank from the Patches page into Crystal before you start browsing. That way you'll have a whole bank of unused patches you can overwrite without having to worry about losing anything important.